Since it was my spring break last week I decided to go on a much needed vacation for a few days. My friend Annie took a few days off of work and we drove down to Vegas. 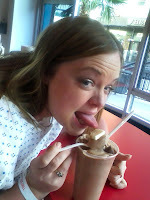 Annie is so much fun to travel with and she even has a traveling agreement (here) which I was willing to comply with. Annie: "I would like it if I could do it with no clothes on!" Me: "No it doesn't and I will prove it to you right now! I have country on it too!" Annie: "Well whenever I have listened to it in the car all it is is hip hop goodness." Me: "Oh that's a good title for a playlist, I'm totally making that!" This clip from one of the Friends episodes was mostly quoted whenever I was making a mess in her car and would apologize. Or whenever I was un-paking my stuff in the hotel room and made a mess everywhere because what I wanted was at the bottom of my suitcase. This classic scene from Friends was always brought up/quoted! 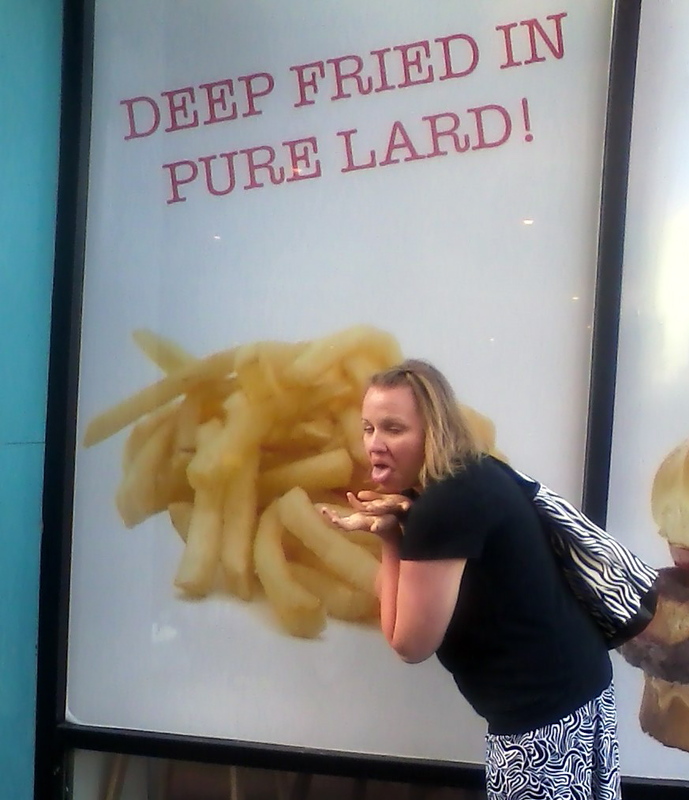 And what both of us said the most during the whole trip was "Keepin' it classy!" 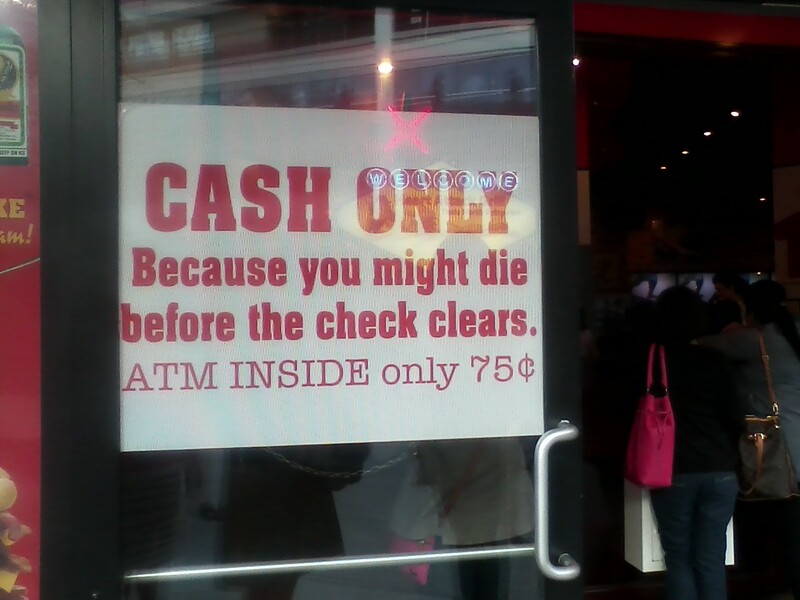 If you have ever been to Vegas you know that it is not at all classy. Most of it is trashy, dirty, and ghetto. (Anyone who knows me knows that I heart ghetto things so much! I love hearing about them/experiencing them/looking at them.) So whenever we would see something trashy, dirty, or ghetto (or did something ghetto ourselves) we would point it out to each other by saying "Keeping it classy!" On average we said "Keeping it classy" about 2-3 times an hour during the whole trip! I also tried to take pictures of some of the classy things we saw. I couldn't take a picture of EVERYTHING trashy, dirty or ghetto and your welcome for that! We went to this super ghetto dollar store that I loved. I wanted to buy these sunglasses super bad! 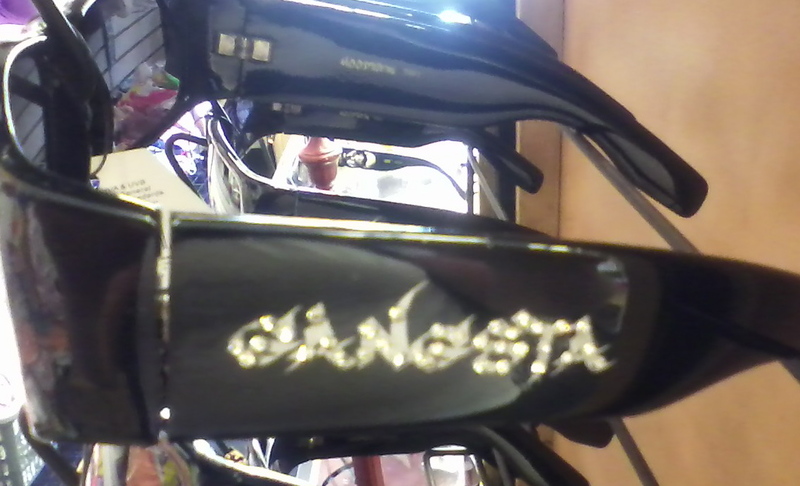 If you can't tell they say Gangsta on the side of them, covered in rinestones. But I looked like this guy wearing them. To which I really have no idea who he is, and have never really watched the show before. My dad would watch it and I hated it. Instead of complaining about watching the show (Which I'm sure I did), My sisters and I would put headbands over our eyes when we were younger and pretended to be that guy. We would run into each other and the wall. I found this more entertaining to do this activity than actually watch the show. Anyway, I figured the sunglasses were not that gangster if they made me look like that guy. That was disappointing. Keeping it classy! 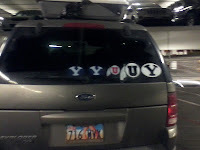 Utah visitor in Vegas. 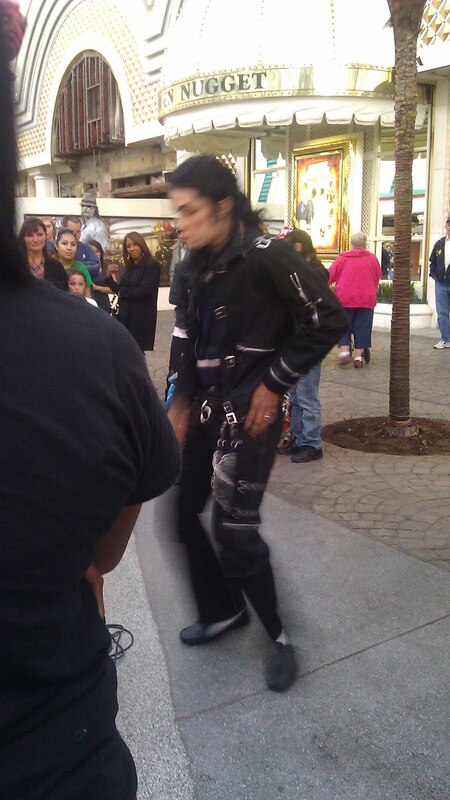 we saw this Michael Jackson impersonator and he was absolutely terrible. 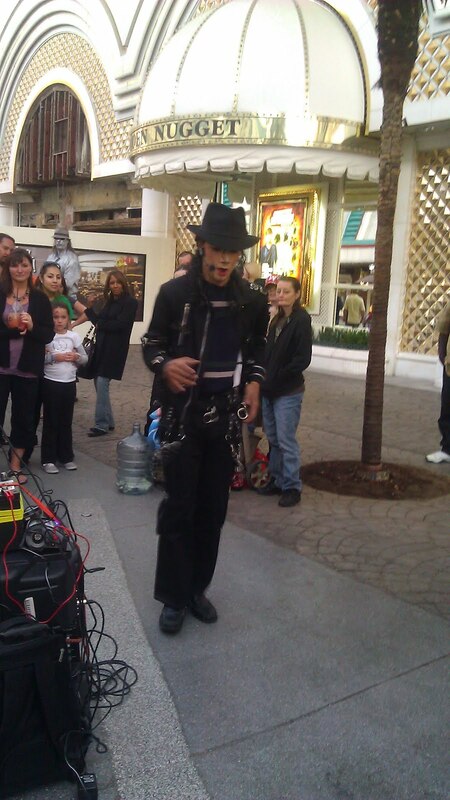 No wonder he started collecting money before he started dancing. It was awful! The moment he started, people started leaving. I think the guy thought we were taking pictures of him because we thought he was good. NOPE! Just adding to our "keeping it classy" photo album! After snapping a few pictures we had to leave because we couldn't hold in our laughter and comments about how bad he was anymore. I borrowed my mom's camera and do not have the camera chord to transfer the pictures of everything else that we took that was classy. I'll have to edit this post later with some of those pictures when I get a chance. There are some of us being homeless in front of the Bellagio fountains, and sketchy stuff we found in the hotel room hallway. Tune in later for some of those classy pictures! Sometimes I make fun of Annie because she tends to find older men attractive. Now you may be thinking "Why do you make fun of her?" Just for as an example whenever we watch movie's at our friends Jess and Taryn's house we will all be saying how attractive the young heart throbs are in the movies and Annie will frequently comment about how attracted she is to the young heart throb's grandpa in the movie! So as we are eating at the not so good buffet at the stratosphere and I am complaining about something Annie says, something like I'm not complaining because the view from here is so nice! I could tell she was checking out someone but I couldn't see him from where I was at. I tell her to take a picture of him on my phone and show me. She snaps this picture and I immediately say "NO HE'S NOT!" She tells me to be quiet because he might here me. As we are leaving I get a look at him. 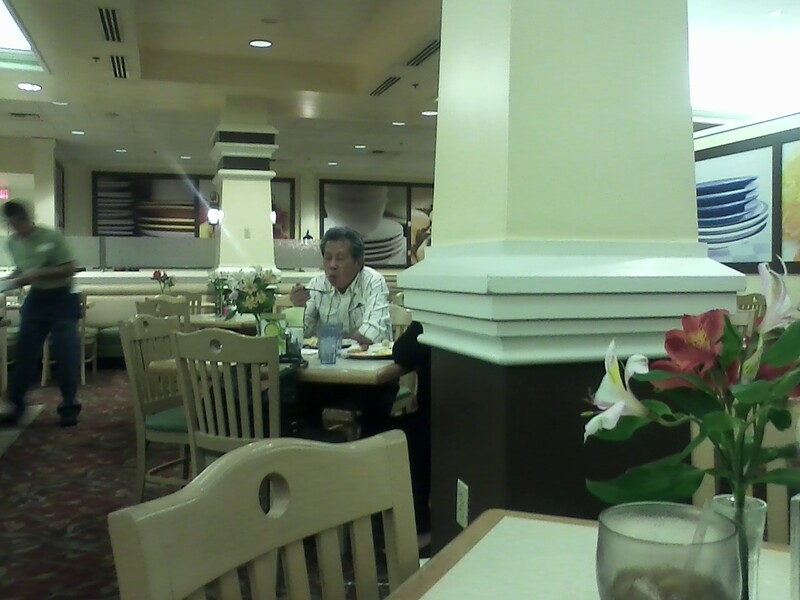 I'm sorry Asian Grandpa, I'm just not attracted to you! Then at one point we saw this guy. . .
And I just shake my head yes! 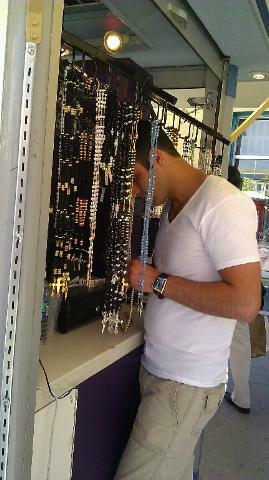 We were not going to buy a bracelet from him but we just wanted to look at him! We go to a few other stores then walk by him again and try taking pictures of him without being creepers, and this is the best we got. Sorry for the booty shot lady in the cheetah skirt, we were trying to get a picture of hot sauce without being a creep. Looks like you like yourself a little hot sauce also! ME: "Why is he so attractive, I just don't get it! (He even had the most beautiful accent) We need a name for him since we don't know his real name. Hmm. . .how about we call him Hot Sauce!" Annie: "LOL YES! HOT SAUCE!" The rest of our trip we made references to hot sauce just about as many times as we said, "keeping it classy" We even labeled Hot Sauce as number 6. So whenever we parked somewhere in parking garages we knew which level we were parked on level 6= hot sauce Level 5=one less than hot sauce Level 3=three less than hot sauce. After that we always remembered where we parked! And don't worry whenever we didn't know what to do we joked around about going back to the outlet mall to see hot sauce. We actually went back the next day to see him (and spend our winnings that we won gambling. . .which I will share that story soon) but he was not there. It was someone else selling those crappy bracelets. It was sad for us. Ok so here is the rest of the story about what happened in Vegas. We decided to gamble. Before you continue to read I would like to say something "Don't judge me because I sin differently than you." (and decide to blog about it!) Ok there, it is out in the open. 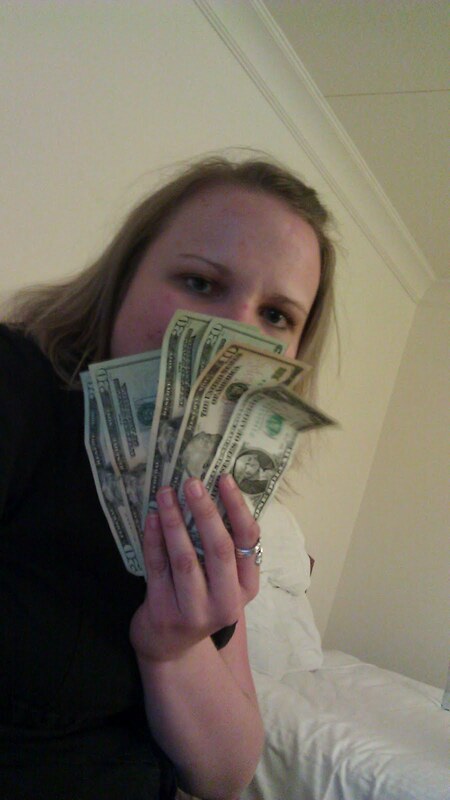 Yes, we gambled only a few dollars and if you want to judge us than so be it! We started putting a couple bucks in the video game jack black. We switched off every other turn while playing. (I learned how to play black jack a few months ago) Every time it was my turn I was so nervous and would ask Annie If I should stay or go try my luck? She would always say "It's your decision!" I love how supportive she is of me! 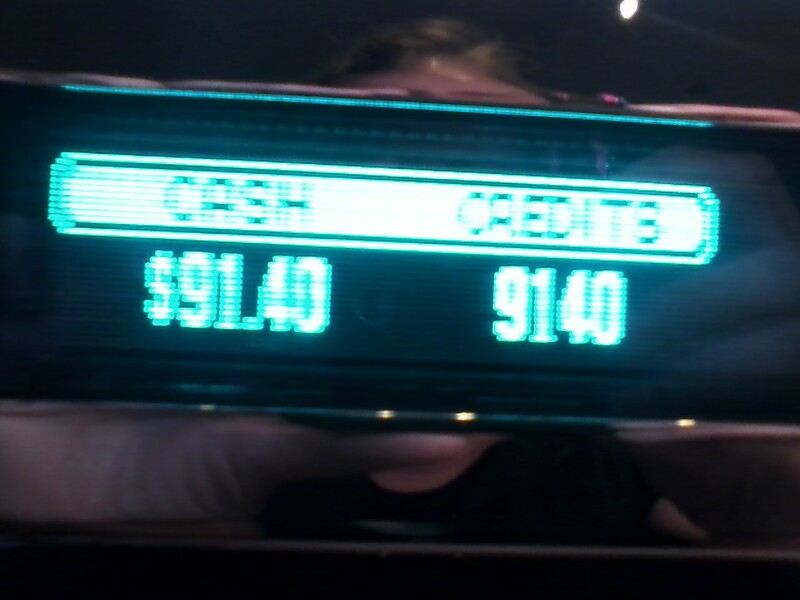 Anyway, we decided to eventually cash out on $1.40 and go play the penny slots. I'm not going to lie when we were playing black jack I was watching this beautiful black woman play the penny slots and I wanted to be her. . . mostly because of those two things, being black and beautiful. Anyway, she had been there for a long time. Just as we decided to cash out on black jack I saw her leave the penny slots from across the room (I'm not a creeper I promise). When we decided to go play the penny slots I knew which machine we should choose. We were totally the lurkers just like phoebe (If you have seen that friends episode then you know what I am talking about)! So we put in our $1.40 voucher and push spin. We ended up winning 7 free spins and in the midst of winning 7 free spins we won 7 more (a total of 14 spins for all of you confused people out there). So we just pretty much sat there watching the machine spin itself. It started lighting up and making a lot of noise. I was really confused as to what was going on and just saw the money getting higher and higher. I turned to Annie and she said, "We won! 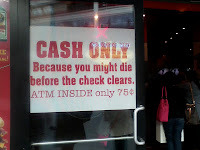 like 800 credits!" Me: "What does that mean?" 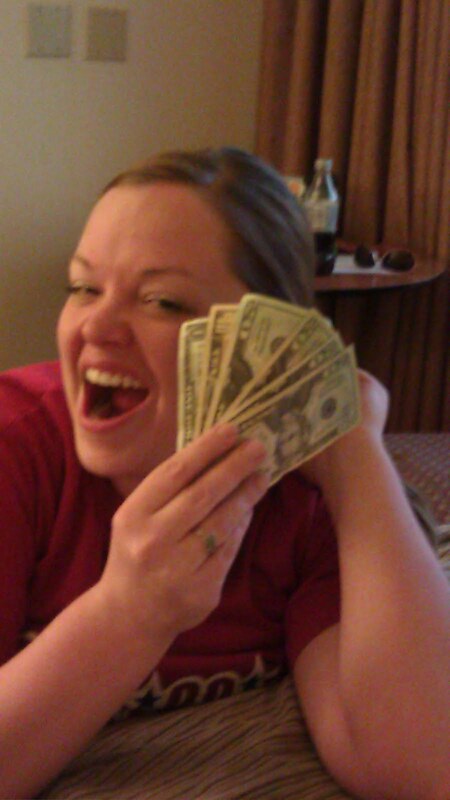 Annie: "It means we won like $80.00!" Me: SHUT UP! We won!?!?! I'll be the one to burn in H*** for this!" I then stand up and start doing a victory dance! Don't worry everyone around us was laughing and we just got more and more excited! 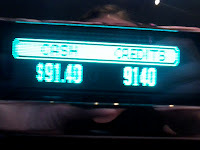 We ended up winning $91.00 and we were SHOCKED! We definitely cashed out at that point! We went up to our hotel room and were still freaking out and could not believe what just happened! We wanted to go buy holy sontos bracelets (pictured on the side) from hot sauce because we were not going to spend our own money on those bracelets. 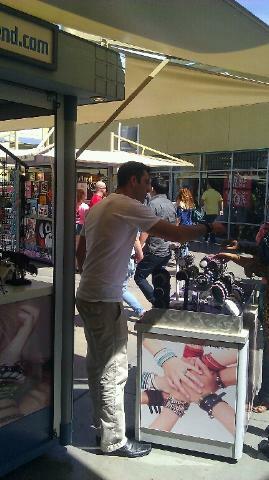 When we went back the next day to stalk I mean buy something from him, he was not there. So we split our money and bought running shoes instead. Let me just tell you, they are the most AMAZING running shoes ever! I think I will have to do a separate blog post and explain just how fantastic these shoes are. They deserve their own blog post attention for sure! Sorry I know this is getting long so one more story then I'm done. We also decided to eat at the heart attack grill. This place is everything that is implied in the name. 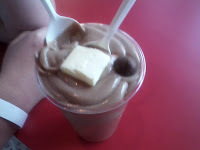 The shake was made from pure cream, the fries are deep fried in lard, and the burgers who knows what all was in them. 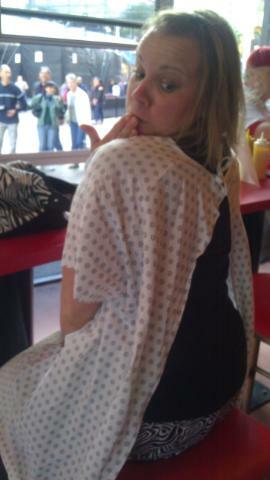 When you arrive they give you a hospital bracelet and put you into a hospital robe. The waitresses were dressed up as nurses and there was even a fake doctor on site. Yes, there really was a slab of butter on top of the milkshake as a topper! 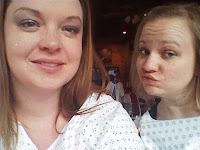 Us in our hospital robes "keeping it classy" for sure! Someone didn't tie my hospital robe all the way! And this is how I felt the next morning. 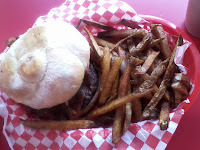 Although I did not throw up, I was having stomach issues. It hit Annie much faster, about half way through the meal. And that was a brief overview of our "Keeping it Classy" Vegas trip! For ONE, I have to meet Annie. For TWO, you should have bought those sunglasses & brought them home for me. For THREE, IF I WAS THERE I WOULD HAVE GOTTEN HOT SAUSE'S DIDGIETS FOR YOU THAT DAY! !